After nearly 30 years, Frederick resident Dana French, right, the former captain of the USS Robison, a guided missile destroyer, meets Nguyen Pham of Boston, one of the 264 people he rescued from a 40-foot boat in the Gulf of Siam. Nguyen Pham stood on top of the 40-foot wooden cargo boat that held 264 Vietnamese refugees trying to escape the country. He waved semaphore flags signaling distress as the USS Robison and other destroyers from the Royal Thai Navy sailed past the refugees in the Gulf of Siam. "We just became so despondent. We had our hope up that we would be saved, but then we saw the ship just travel away," Pham said. "People just get crazy. I saw my two friends die." The date was Dec. 12, 1980, and Dana French was the commanding officer of the USS Robison at the time. The Robison was participating in an exercise with the Royal Thai Navy in the gulf. French's ship was on the east side of the formation, and he noticed Pham signaling from the top of the refugee boat. "I reported this to the Thai commodore who was in charge of this exercise," French said. "He rogered for it and said 'we can't stop now, we have this exercise to do.'" The USS Robison and other destroyers continued on past the refugees with no contact. "When you get into a situation like that you just get broken down," Pham said. "I don't think you can predict your actions. Some people just step off the boat." 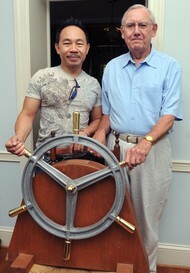 Pham was 22 at the time and was on the rickety riverboat because his father had earned a spot on it to escape Vietnam. The other refugees each paid about $3,000 in U.S. currency at the time. He was fleeing Vietnam because his father was involved with the South Vietnamese government -- he was a police officer -- and he had no opportunities because of that. "We're not given any chance of going to college or anything like that," Pham said. "At every junction of society interaction, you are always identified as who you are by what your dad did, basically. There is only one choice and that is to leave Vietnam." This was Pham's seventh time trying to escape the country on a refugee boat. The first time he was captured and put in jail. That first failure didn't deter him. "I tried second, third, fourth, fifth, sixth. Every time it failed," he said. "You have to manage not to get captured again in some very isolated area that you don't even know where it is in your own country." The USS Robison returned six hours after the first sighting of the refugee boat to find the refugees with a Thai fishing boat. This time, French decided to take action. When the pirates saw the American destroyer, they appeared to be helping the refugees, but had actually been robbing them. Pham was taken off the refugee boat and put into what he described as a "big container for fish" on the Thai fishing boat during the ordeal, while other refugees were robbed. "They tried like hell to represent themselves as good guys," French said. "If I had known what they had been doing, I would have arrested them and taken them to Thailand." French sent four or five officers to rescue the Vietnamese from their boat. When the naval officers arrived at the boat, they found hundreds of people living in filthy conditions. "When they came aboard, a lot of them, their clothes were saturated with vomit and everything else," French said. Originally there were 302 people on board, but when the Navy arrived only 264 were still alive. Some died when part of the boat collapsed, others from dehydration and some just went mad. "Some people just go crazy and they walk off the boat," Pham said. There were two layers to the boat and each refugee squatted down shoulder to shoulder with less than a foot above their head to the next layer. Once the refugees were on the open sea, a few of them could move around to the top of the boat, but most had to stay seated; they had nowhere to move. Once on board the USS Robison, the crew washed and fed the refugees. They made them clothes out of anything they could find, including bedsheets and towels. "When this group came on board, the crew just turned out 100 percent to help them and it was very heartwarming to watch," French said. Every officer on the USS Robison was presented with the Humanitarian Service Medal for their actions toward the refugees. "The Navy rescued a lot of boat people over the years during that period of time," French said. "At the time that we did it, it was the largest number of refugees on a boat that had been rescued." When he stepped on board, Pham had finally escaped Vietnam. "I said thank God, life is here again," he said. "I thought we were all dead, but when I was up there I know that I'm safe." Dana French and Nguyen Pham never spoke during their time together on the USS Robison. Friday, July 23, 2010, was the first time French contacted Pham through e-mail. "When he sent his message back to me he said 'you saved my life,'" French said. "He was good enough to thank me on behalf of all the others for doing that. I was quite moved by him saying that." On Friday, Pham drove from Boston with his family to visit French and his family in Frederick on Saturday. After being rescued in the gulf, the Navy turned the refugees over to the United Nations in Thailand. For the next 71Ú2 months, Pham bounced around from refugee camps in Thailand, Singapore and Indonesia. Since he had no relatives in any of those countries he was allowed to enter the United States because it was the country that rescued him. On July 23, 1981, Pham moved to Memphis, Tenn., sponsored by Catholic Charities USA. He lived there for two weeks, but wanted to move to Boston. "I've learned about Boston all the way from Saigon, it's the center of education," he said. Pham was given $300. He spent half of it on a bus ticket to Boston, where he lived with a friend he used to work with in Saigon. In Boston, he attended Bunker Hill Community College, then the University of Massachusetts Boston, and finally graduated from Boston University with a degree in computer science. Pham worked for 14 years with the Boston Police Department as an interpreter in the Community Disorder Unit. Today he works as a principal consultant at Fidelity Investments, where he has been for 23 years. His wife, Tyuen, was also a Vietnamese refugee in the early 1980s, but they did not meet until they were both living in the U.S. His eldest daughter is set to begin her first semester at New York University in the fall. Pham doesn't consider himself hugely successful, but rather blessed with a great environment. "I tell my children, everybody can be whatever they want to be in America," he said. French retired from the Navy as a captain in 1990. "The bottom line is, I'm sure glad I stopped," French said. "That may be the most important thing I've ever done in my life."